The CasinoFlex Systems International team sends out a warm welcome to come and see the key innovations that will be released at the forthcoming ICE between 5th and 7th February. The stand number is # S5-102. This young and dynamic company has always put customer requirements first. Each casino or gaming location has its own specific needs and requirements. There is no one solution that fits all. Furthermore, casino managers cannot always know which solutions best fit their own requirements. Here specific, detailed on-site advice takes away any uncertainties. “We at CasinoFlex Systems International team have decades on experience in systems technology. We have worked for many years both for gaming operators and manufacturers. We have seen the weaknesses in the market and have focused from day one in creating a stronger portfolio with the dedicated service to match. We firmly believe in investing the time and focus with our customers to ensure they are made fully aware of the opportunities a system offers and secondly that they are trained to make full use of these”, comments Tim Klok, Managing Director at CasinoFlex Systems International. Visitors to the stand can see how they can benefit from the new innovations. The Player Tracking Module is even more interactive. New marketing tools will be released. In addition to that, customers can now make use of a new TFT colour screen – available in any size. Video content can also be streamed. Please visit CasinoFlex Systems International at ICE to learn more. The FADJA show in Colombia has been a show to remember for CasinoFlex Systems International. It was the first time that this company exhibited and it made a difference. Visitors not only from Colombia but also from all around Latin America made full use of the show to come and see the team of CasinoFlex Systems International and find out more on this rising star in the global gaming systems market. “Systems was the buzz word at the show and we were very proud to have welcomed so many operators to our stand. We made a great deal of new contacts at the show and are excited on our prospects in Latin America. We introduced our new Spanish employee, Sergio Gallego, showing our clear intention to support the market. Several operators were surprised to learn that we customise our system to their needs – so can provide exactly what they require. The fact that our system is licensed by BMM in Spain reflects that our system meets all legal requirements”, stated Mr. Tim Klok, Managing Director at CasinoFlex Systems International. “Our team sends out our thanks to everyone who took the time to come and see us”. 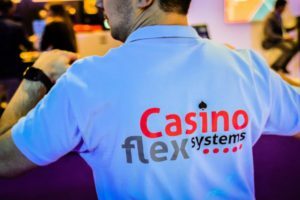 Interest and demand for systems solutions from CasinoFlex Systems International continue to grow as more operators are seeing the difference this company makes – offering a customised system, tailored to each operator’s needs. The in-depth preparation and discussions with casino personnel at different levels with each individual customer cements the dedication, knowledge and experience this company offers. CasinoFlex Systems will be exhibiting at FADJA 2018! CasinoFlex Systems is happy to announce that we will be exhibiting at FADJA (5-6 April 2018). We welcome existing and new customers at stand #5, where we will have a range of new developments on display. CasinoFlex Systems International has appointed PEJ (Productos Electronicos del Juego) from Barcelona, Spain, as its distribution and service partner in Spain representing a major breakthrough in the Spanish gaming market. This agreement enables CasinoFlex Systems to serve a further key gaming market and respond to the enquiries from Spanish gaming operators who wish to make use of the systems advantages that CasinoFlex Systems offers. PEJ was founded in 2004 and represents renowned gaming companies in Spain. Mr. José Manuel Rojo, Commercial Director at PEJ, explains the perfect fit of CasinoFlex Systems into the corporate portfolio: “At PEJ our philosophy is to support the best companies in the market. We are now excellently positioned to offer systems solutions by representing CasinoFlex Systems here in Spain”. “We wish to ensure that operators around the world can make use of our systems”, explained Tim Klok, Managing Director at CasinoFlex Systems. “Signing this long-term agreement with PEJ places us in an excellent position in Spain. Our system is naturally available in Spanish. The first deals are already lined up with the focus on TITO and jackpots becoming ever stronger in Spain. We are very excited about our opportunities here”. This good news shows how CasinoFlex Systems – the new star in the systems market – is further growing. CasinoFlex Systems will be exhibiting at ICE 2018! CasinoFlex Systems is happy to announce that we will be exhibiting at ICE 2018 (6-8 Feb 2018). We welcome existing and new customers at stand #S5-102, where we will have a range of new developments on display. CasinoFlex Systems International is the new star in the casino systems market. Founded only two years ago in 2015, this company already has connected over 4,000 slot machines. This number is not going to stay still. Already the forecast for year end has been set to over 6,000 slot machines connected. Just look to Bulgaria to get an insight why this company is growing so quickly. CasinoFlex Systems International is already the market leader here for systems. The reason is both simple and clear: no other systems company was able to satisfy the thorough and extensive customer demands and market requirements in Bulgaria. Managed by both founders Tim Klok and Bas Baarbe, the philosophy behind the success at CasinoFlex Systems International is to provide an individual solution to each and every customer. The international casino is very complex and diverse and customer requirements naturally cannot be the same. The team respects this and does not even try to enforce a ‘one solution fits all’ mentality. On the contrary, each customer is managed individually and great emphasis is placed in finding out precisely how this customer can be best helped. A casino system can create a new realm of opportunities for a casino operator and the team at CasinoFlex Systems International always ensure that each customer has the right solution to fit their needs. “The casino system is central to any gaming location. Today this is even more the case. Governments are often demanding more transparency and direct, real-time information flow of land-based gaming machines. This applies both to slots and live gaming tables. There is so much our casino system can offer and we place great emphasis on advising and supporting our customers. We make use of our in-depth market understanding to create the solution that is both ideal and unique to the customer”, explains Tim Klok, Managing Director at CasinoFlex Systems International. CasinoFlex Systems International offers a clear structure of solutions that can be combined together and expanded upon to create the ideal solution. “Systems are often seen as an expensive must-have in the industry. Let me say here that we are breaking the mould – we offer extremely flexible solutions catered to each and every customer – and that at an affordable price. Now every gaming operator can implement a system”, concludes Mr. Klok. CasinoFlex Systems International already has installed its systems at casinos around Europe, Africa and Latin America. This reflects the ‘International’ in the company name. Tangiamo Touch Technology AB is an advanced technology company offering innovative and proprietary software and hardware solutions for the gaming industry and other industrial application areas. The company operates within three business areas; Touch Technology, Electronic Table Games and Online Gaming. 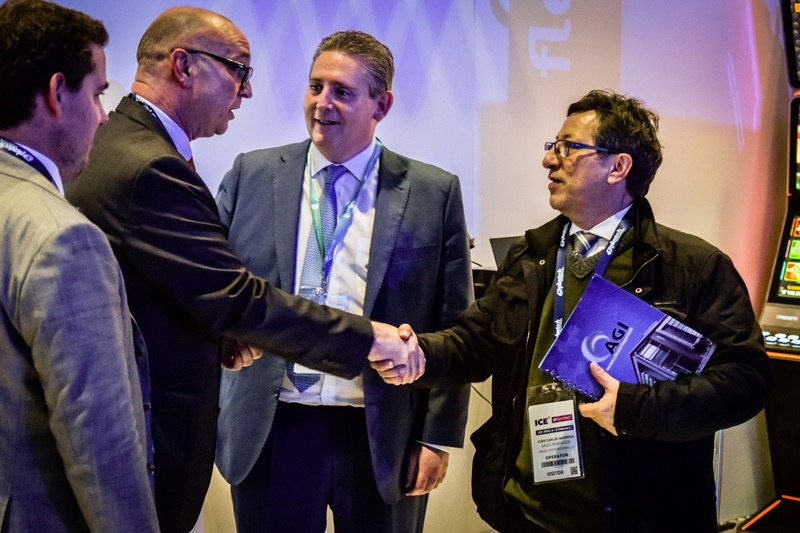 CasinoFlex Systems International signs an agreement with Tangiamo Touch Technology AB and becomes their exclusive distributor for Eastern Europe. Tangiamo is well known for their unique electronic roulette products. Please visit their website and company brochure. Jackpot Digital latest product, Jackpot Blitz. Please visit their website and Press release. CasinoFlex Systems International expands their business into Middle America and Africa. © 2018, CasinoFlex Systems International Ltd.